For a change, try swapping the pork for mini chicken fillets or strips of chicken breast. 1. Heat the oil in a large frying pan and cook the pork for 5–8 minutes until nicely browned. 2. Meanwhile, dissolve the curry mix in 500ml boiling water, stirring until smooth and thickened. 3. 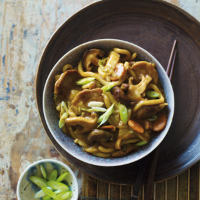 Add the carrot, Chinese leaf and mushrooms to the pan and stir-fry for 3–4 minutes until the vegetables are tender and the pork is cooked through. Add the noodles and sauce and continue to cook for a further 1–2 minutes until piping hot. Divide between 4 bowls, drizzle with a splash.